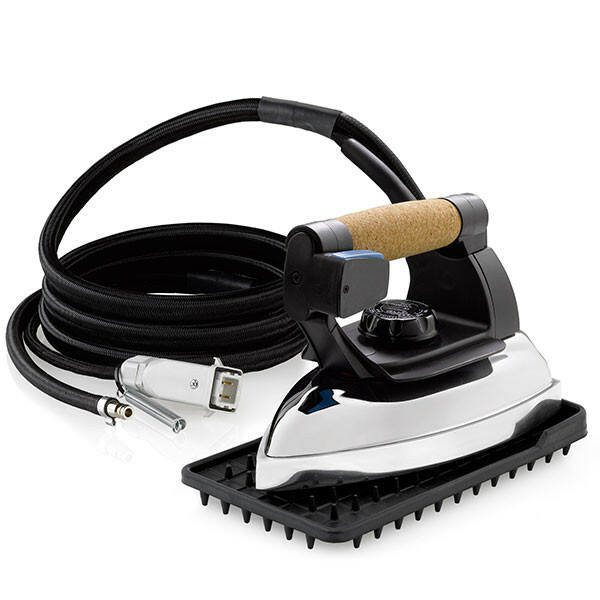 $50 More Cost for Reliable i60 Heavier Professional Steam Iron Head 110/220V, for i500, 7000IS Boilers Only. 6.6 Pounds, 32 Chambers, Cork Handle, Silicone Iron Rest, 7' Hose, Cord, Add Under Options Menu. *ETL Approved for 20 Amp Plug. 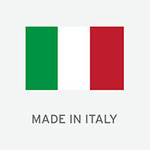 Has one vertical flat blade, one horizontal flat blade, and one round ground pin for Canada. Must change plug if using in socket with 2 vertical plug in receptacles in the USA. Stunning design, coupled with outstanding performance separate the stainless steel 8000IS boiler from the rest of the competition. Ideal for use in a tailoring shop, sewing workroom, or in a factory environment, the 8000IS is an extremely versatile boiler. 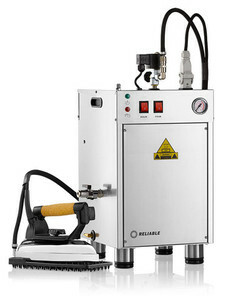 All of the convenience features are standard to make your job easier: a 4.5 liter water capacity in a stainless steel tank, blow down function, back up replacement element, low water level indicator, quick disconnect for the steam and electrical connection, and of course, Reliable™'s trusted reputation for building quality, long lasting equipment. The i30/2100IR, 3.9 pound industrial iron, has a die cast aluminum plate with 32 steam chambers. There is no condensation even with an extra long steam hose. 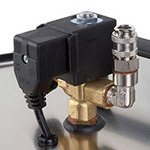 Hook it up to our 8000IS boiler, or with any ironing system that uses a solenoid steam release valve. The i30/2100IR comes complete with a 7 foot length high performance silicone steam hose, high temperature iron rest and of course, Reliable™'s trusted reputation for building quality, long lasting equipment. The 8000IS requires the iron i30/2100IR. 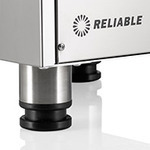 Reliable™ understands that the quality of a boiler/iron is only as good (no matter how nice it looks) as what is inside it. This is why we use 12-gauge wiring throughout, a ceramic (not plastic) terminal block, Teddington pressure control and an all stainless steel steam tank to eliminate the chance of rust. 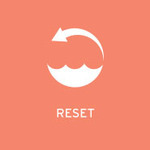 A sensor on the element automatically detects when the water level is low, and shuts itself off. A light will come on, telling you it is time to refill the tank. 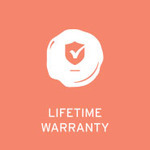 The 8000IS is easy to use and to operate. Simply fill it up with regular tap water, plug it in, and in 20 minutes you will have beautiful dry steam. The easy one step cleaning process helps you keep the steam vessel free of hard minerals that would otherwise damage the boiler. The 8000IS is the only commercial boiler with a spare element built into every unit. If for any reason the element stops working (if it is run without water for example) simply switch the wiring to the spare element and you are back in business. 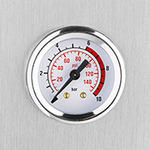 All Reliable™ Steamer boilers have a built-in pressure gauge so you don’t have to guess what the operating pressure is. This is an important safety feature, and one you will not want to live without once you have used it. Others promise dry steam, but our 8000IS delivers the driest steam in the industry with a regular operating pressure of 80 P.S.I. The unique iron that comes with the 8000IS has a labyrinth system that separates the water from the steam, guaranteeing dry steam. 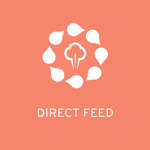 DIRECT WATER FEED The 8000IS provides continuous steam for an unlimited amount of time as it must be hooked up to a direct water line. PRESSURE GAUGE A pressure gauge is standard on the 8000IS. It gives you a constant, visual indicator of the internal boiler pressure. BLOW DOWN VALVE Cleaning the inside of the 8000IS is a simple task with the supplied blow down valve. ADJUSTABLE FEET The 8000IS is supplied with commercial grade heavy-duty adjustable feet that allow the unit to be leveled to the working surface.